The population of San Diego County is estimated to grow beyond 40,000 households in the next 15 years based on prior years expansions. With that in mind, the community has been working with SANDAG and TransNet to decipher what the best priorities for our local communities are in hopes of meeting the needs of such a population growth. SANDAG projects that by 2050 the county population would exceed 4 million. These projections have established a great deal of contract work for housing and transportation and many members of the community who have been made aware of these plans have already begun acting towards the inquiries and foreseen projections on development. 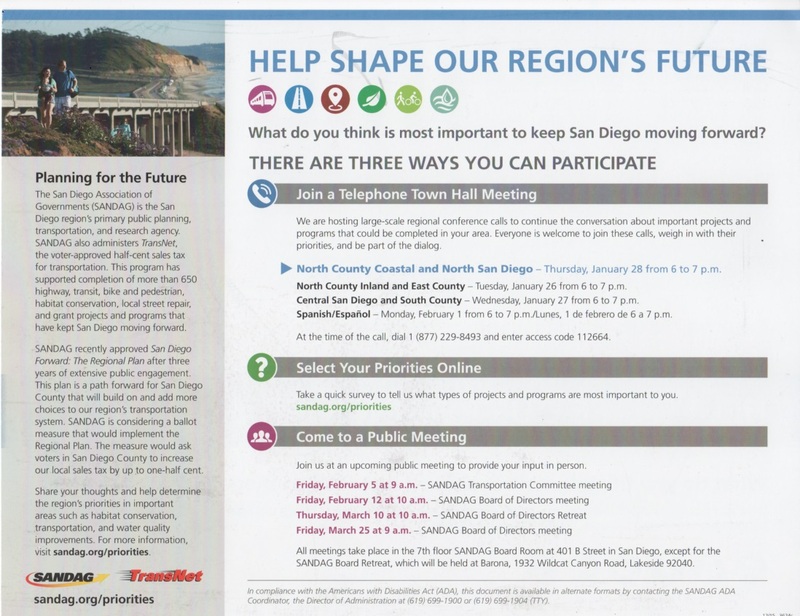 To help keep San Diego beautiful and to have your voice heard about the many progressions that will be taking place in the next few decades SANDAG and TransNet are urging people to participate in the conversations taking place. These meetings will be hosting conference calls about the many important projects and developments that are hoped to take place near your area. North County Coastal and North San Diego will take place on Thursday, January 28, 6-7 pm. North County Inland and East County will take place on Tuesday, January 26, 6-7 pm. Central San Diego and South County will take place on Wednesday, January 27, 6-7 pm. Spanish/Espanol will be available on Monday, February 1, 6-7 pm/Lunes, 1 de febrero de 6-7 pm. Lastly, simply attend a public meeting! Provide your opinion and take an active part in person.